Hey, folks!! Excited to get back to posting after a successful National Novel Writing Month! 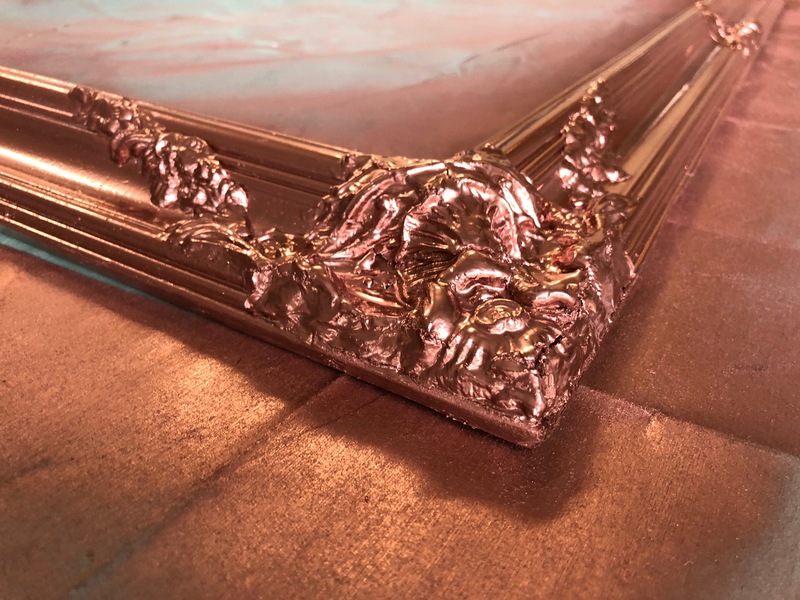 This week, I’ve got a step-by-step guide on repurposing an old mirror. Although I use mine as a vision board, yours can be whatever you want! But guaranteed, you’ll feel awesome every time you look at it. 😀 So let’s get to work!! So, step two: tear that thing apart. 😉 We saved the paper backing for later***, but when it was gone, we realized our frame was, in fact, two frames barely sticking together. Hence the sky filtering through it. 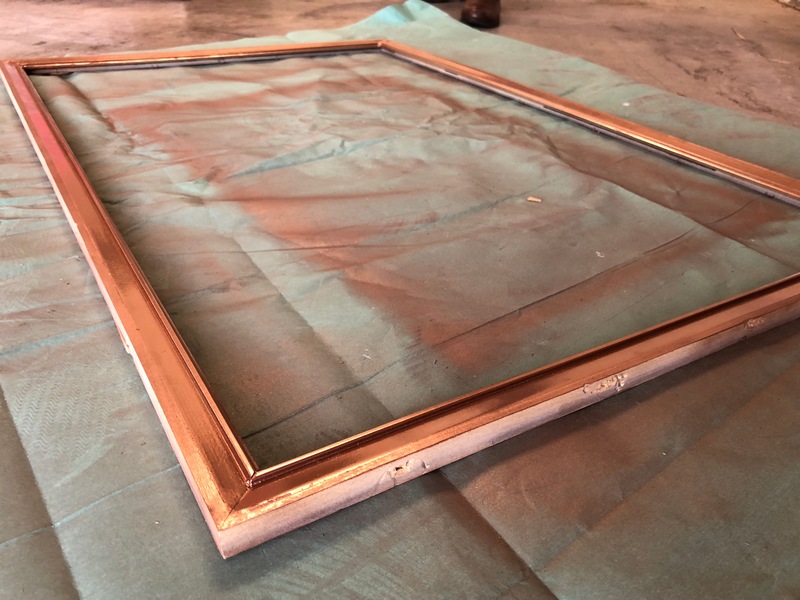 This wasn’t a simple painting job today–we needed to reinforce this frame so it would last for years to come! 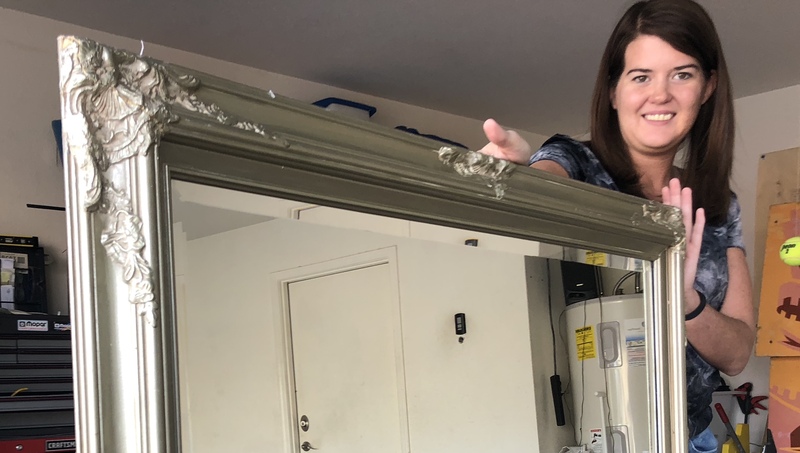 We carefully removed the mirror, which basically involved bending the staples upwards with a flathead screwdriver, and popping the mirror out. TIP: Mirrors are fragile… obviously. If you break your mirror, DON’T PANIC. Instead, think creatively! Corkboard squares can be used to fill the rest of the frame! Another friend, the lovely Kayleigh, with her corkboard fix! The little frame had completely snapped at one corner. It dangled in the breeze as we caught our bearings. The bigger frame suffered damage too; part of the lovely molding had popped clean off, and the piece shattered on impact with my garage floor. So, time to fix everything. We realigned the broken corner of the smaller frame, then used the wood glue to secure it. Before the glue dried, we wrapped that corner in paper towels and positioned it within a utility vise to really make sure it adhered flat. After the glue dried, the paper towel was sanded off and a staple gun was used perpendicularly in every corner to ensure it wouldn’t happen again! Our inner frame was fixed! Then we turned our attention to the bigger frame. Now, the paper backing had been secured with staples, so we spent quite a bit of time removing those. Once that was done, we sanded the back of the frame to remove the dried glue and rough edges left by the staples. This frame was structurally sound, so no staples or glue needed. However, the molding had LOTS of cracks. Some cracking is A-OK for that vintage look, but this was excessive. We used wood putty to fill in the gaps. It’s like silly putty: just work it into the cracks until it covers everything smoothly. The molding is the best part of this frame, so I was insistent we fix it. We gathered the shattered pieces best we could, and glued them back onto the frame. There were gaps left where the shattered pieces were too small to bother, so we filled in those with more wood putty. Wood putty takes a loooong time to dry, but we kept working around it. Just be cognizant of where it is on your frame, so you don’t smear anything. We didn’t think about how to reattach the smaller frame until after we painted, which was a mistake. Staples obviously weren’t a good option, because of the angle of the wood and the length of the staples. Instead, we settled on a super-strong putty adhesive, coupled with wood glue. But since we’d already painted the frames, we arrived at Problem B: drippage. Mainly, wood glue drips. 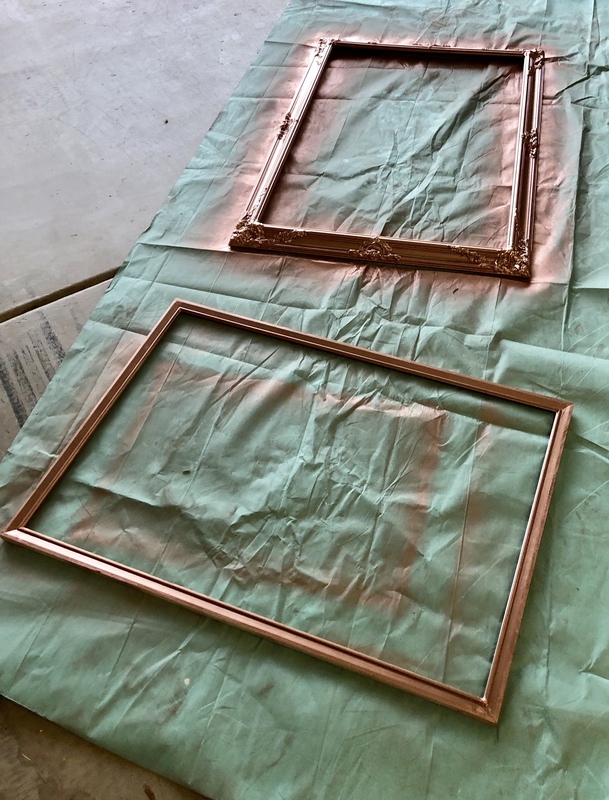 All over our pretty rose gold paint. Solution? Paper towels, strangely enough. The wood glue was soluble (dissolves in water), so we wet a paper towel and wiped off what we could. Then I went back with a dry paper towel and scrubbed lightly. 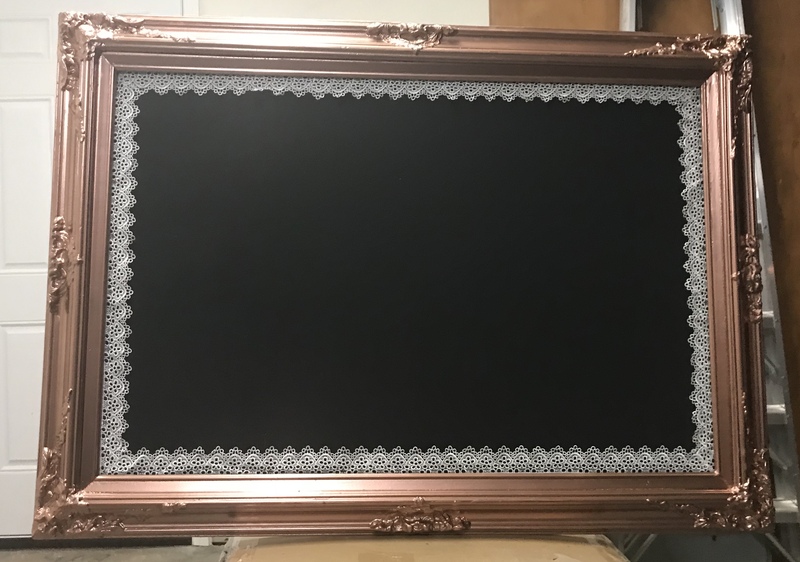 The glue came off well enough that a third coat of spray paint covered any residue, leaving us once again with a gorgeous frame! 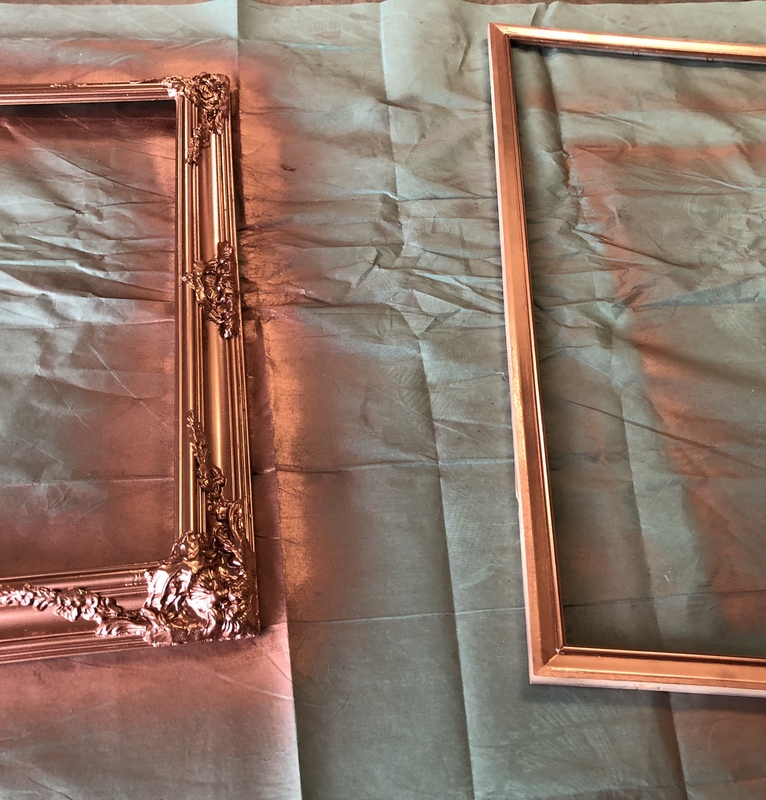 When we finished, we set the frame aside and returned to the actual mirror. Now, this mirror had a beveled edge. 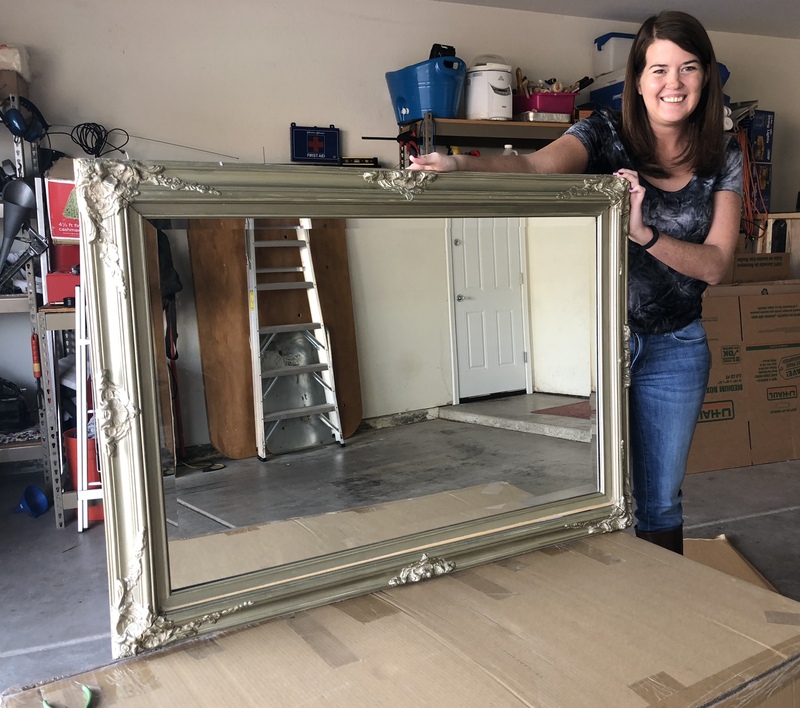 Since it was Jackie’s vision board, she made the executive decision to keep the mirror side intact. Instead, we flipped it over and painted on the back. That way she can return it to a mirror later, if she wants! She decided to use magnetic paint. The can was $20 at Home Depot. I’ve only ever used chalkboard paint before, so this was a fun learning experience! When you’re painting, make sure to use a high-density foam paint roller. Anything else will streak on such a smooth surface!! CAUTION: Stir the magnetic paint very well. It’s thicker, and all the good stuff settles fast. And again, use a HIGH-DENSITY FOAM ROLLER for application! We applied three coats of paint over the course of the day. The magnetic properties aren’t amazing, but they’re decent enough to hold a piece of paper with the right kind of magnet. 🙂 Since it’s a primer, you can definitely use chalkboard paint over it and get the best of both worlds! After the magnetic paint dried, I was thinking about how to make it look even cuter. I love classy vintage decor, especially with touches of feminine charm. So I pitched a bit of texture to the vision board via white lace, and Jackie loved it! TIP: With ribbon, always buy more than you think you’re going to need. Better yet, measure the frame before you go to the store. It was easy to get the lace on the mirror. A few dollops of glue every couple inches did the trick! We left the edges longer, then went back with a pair of scissors and cut it best we could so there was no overlap. Always make sure you start wide, and make small adjustments. 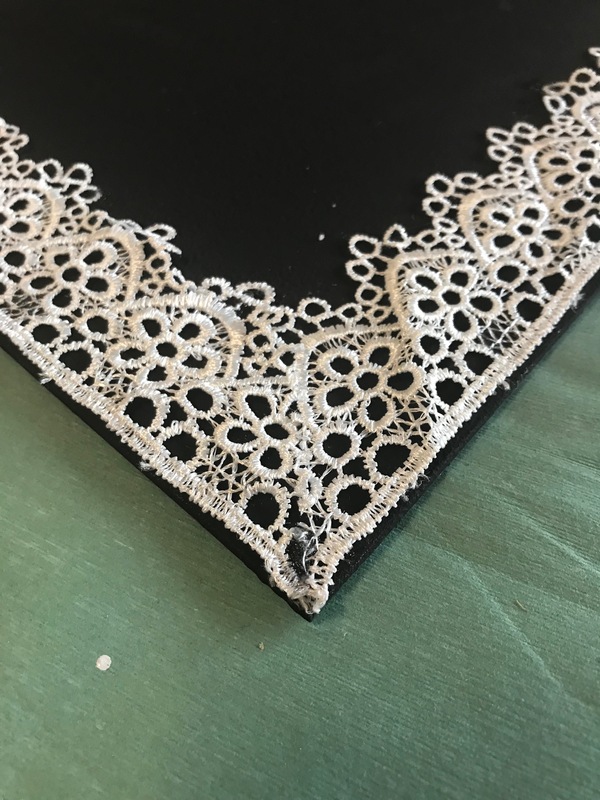 Better to have too much lace than gaps in the pattern! We let that dry, and then… it was finally time to reassemble! The frame didn’t have a great hanging option in the first place, so we screwed in two new holes, one on either side of the frame. To ensure you don’t see the wire holding up the vision board, go about 1/3 of the way down the mirror. After making the holes, we removed the screws to leave space for reassembly. The mirror slid into the inner frame, just like before. We pushed down the staples with that flathead screwdriver, securing it into place. If your mirror came with a cardboard backing, make sure to pad the mirror with it. You don’t want the staples chipping anything if you can help it! Then we laid the ripped paper backing we’d torn off hours earlier*** onto a flat moving box. 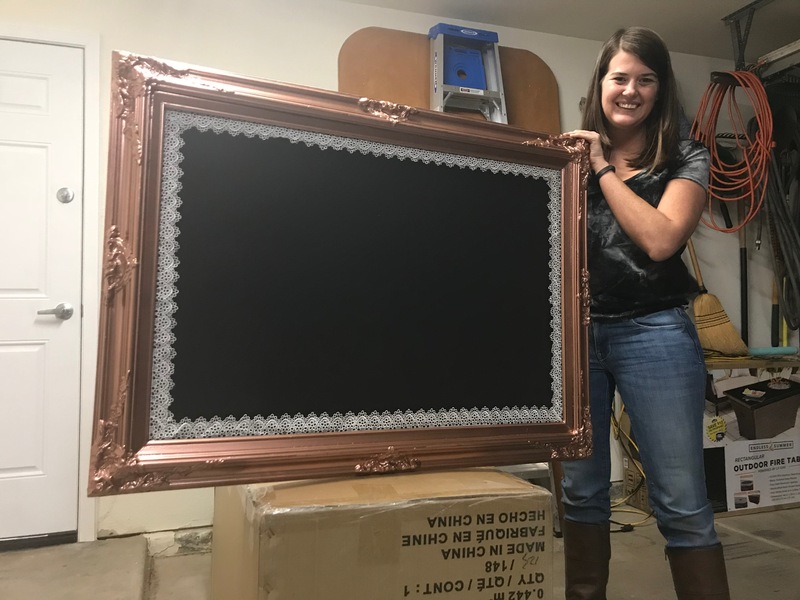 With a box cutter, we sliced a piece of cardboard that was roughly the size of that paper backing, and secured it onto the frame with the staple gun! Finally, we screwed two screws (I’m so good at the words, aren’t I?) into the holes we’d made a few minutes earlier. I left them sticking out a few millimeters, so there’d be room to wrap the wire. 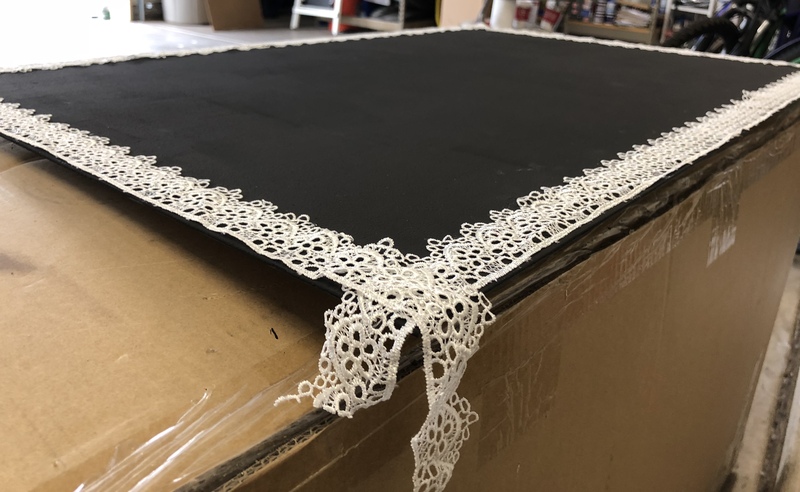 Picture wire can be purchased at any home store, and all you do is twist it around itself a few times so it won’t slide under the weight of the frame. Easy peasy! And that’s it!! Our project took about 7 hours total, but we could have done it faster if we’d been smarter about fixing the frame BEFORE painting. Overall, not too many snafus, though. Every time I repurpose a frame, it looks better and better. 😀 And Jackie got her new vision board, which is excellent! Here’s the before / after shots!! So there you have it! A gorgeous frame, repurposed into whatever the heck you want. 😀 I’ll do a post on vision boards later this month, but with 2018 right around the corner, this is a great way to keep all your resolutions in one lovely space! Have you ever repurposed anything? How did it turn out?? I’d love to know!! <3 As always, feel free to email me and start a chat, or just comment below!